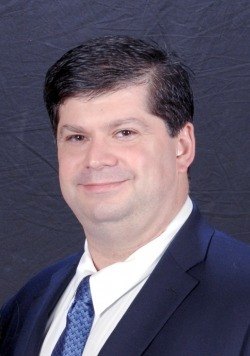 Today’s guest blogger is Joe Sergi, author of Sky Girl and the Superheroic Legacy. Joe Sergi is an author who lives outside of Washington, DC with his wife, Yee, and daughter, Elizabeth. He has published short prose stories and articles in the horror, science fiction, and super hero genres. Joe has also written for comics in the romance, horror, science fiction, and super hero genres. Sky Girl and the Superheroic Legacy is his first novel. In 2008, Joe was selected as a semi-finalist in the Who Wants to Create a Superheroine contest sponsored by the Shadowline Imprint of Image Comics. When not writing, Joe works for an unnamed government agency. Stan Lee once said that he created Spider-Man because he saw a spider on the wall of his studio. Frankenstein’s Monster was dreamed up over a rainy weekend in 1816. 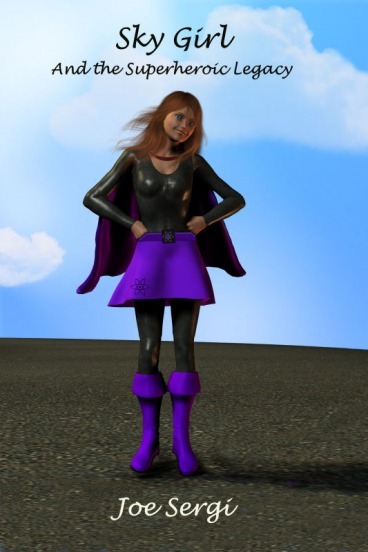 The lead character of Sky Girl and the Superheroic Legacy was conceived in a comic’s podcast forum project and born out of a father’s love for his daughter. The Comic Geek Speak Podcast is made up of a bunch of great guys that love comics. I have listened to them for several years and am still an active member of their forums. It was on those forums that I learned about a proposed prose anthology, which would be written by the listeners of the podcast. I wrote a story called the Return of Power Boy, a story about a middle aged accountant, who may or may not be a superhero. (The anthology was never produced and the story was later featured in A Thousand Faces, the Quarterly Journal of Superhuman Fiction.) The story was a very dark tale of what happens when a super villain wins. One of the very minor characters was the accountant’s four year-old daughter, CeeCee. By this time, I had a daughter of my own, Elizabeth. And I can’t help but think that this is what converted the very dark Powerboy story into the light hearted story of Sky Girl and the Superheroic Legacy. It is also why DeDe is a strong teenager and not defined by the men in her life. Don’t get me wrong, she is not your typical one-dimensional stereotype. Like most of us, DeDe is bold and confident when she is with her best friend and family, yet she is shy and insecure in public, especially when it comes to her crush, Adam, and rival, Nicole. This first book is really about DeDe’s journey to find herself and she makes a lot of good decisions, but she also makes some bad and selfish ones. But, she ends up in the right place. I hope she inspires my daughter to make good decisions. At one point in the evolution of the story, someone had suggested that I make the main character into a boy (because comic readers are predominantly male). That idea never caught on because I think women and men handle conflict differently. This concept is explored more fully in the second book, Sky Girl and the Superheroic Adventures. For example, there is a cliché in comics that when two heroes meet, there is always a misunderstanding that requires the two superheroes to fight before they can team up. DeDe handles this type of conflict very differently when she goes up against another costumed heroine in the second book. Similarly, comics frequently feature the grudge match, where a villain challenges a hero to a fight where the only goal is for the villain to beat the hero senseless (usually culminating in a new costume for the hero and a rematch). In my opinion, a superheroine would not engage in this mindless violence and would instead respond with a polite “no thank you” before flying away. Does that make women better heroes–absolutely not–but it does allow an outlet for more creative storytelling. At the end of the day, Sky Girl and the Superheroic Legacy, and the character of Sky Girl is the culmination of reading far too many great comics, finding far too few strong female characters and loving my daughter just enough. I would like to thank The Children’s and Teens’ Book Connection for letting to talk about the secret origin of Sky Girl. 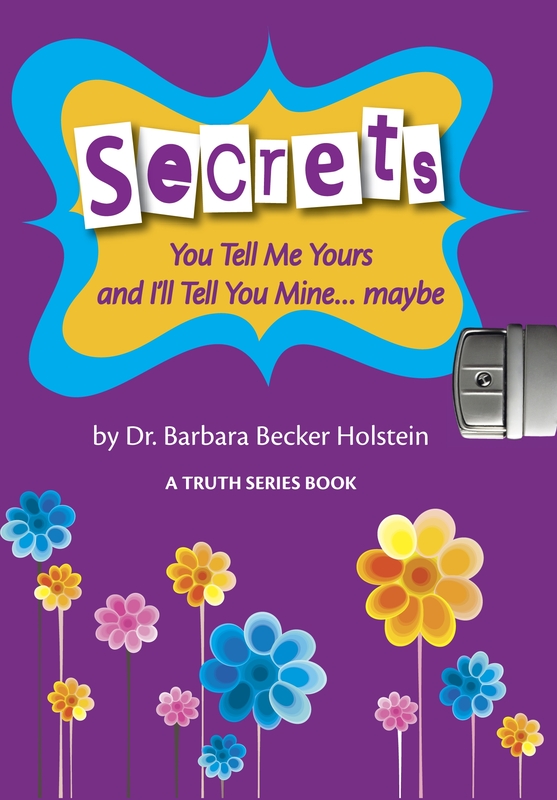 Joining us today is Dr. Barbara Becker Holstein, author of Secrets: You Tell Me Yours, I’ll Tell You Mine…maybe. This is the second book in The Truth Series for girls. The Truth: I’m a Girl, I’m Smart and I Know Everything, the first book in the series, is also available at Amazon. Since this book is written as a series of diary entries from the girl, now 13 years old, we asked Dr. Barbara if she had any diaries as a kid and if she remembered anything she had written in them. DEAR DIARY, TONIGHT I LOVE LUCY IS ON! I CAN’T WAIT! I started to keep a diary when I was nine years old. Actually, it was a leather bound Girl Shout Diary purchased downtown in Reid’s Department Store in Bridgeport, Connecticut. Yes, I do mean ‘Girl Shout’. You see, I was dyslectic. Spelling was not my strong point. Now as I look back on a typical excerpt, such as the one above, I realize how I shied away from any comments that reflected thoughts or feelings that were uncomfortable to me on any level. I never talked about my parents’ arguments or if my feelings were hurt. I never mentioned the one episode I had when a neighbor was inappropriate as I walked home from school. Although I felt upset for months about the episode, not a word was said in the Girl Shout Diary! Most of the feelings I was willing to share in the diary were happy ones, such as my pleasure watching I Love Lucy or the excitement I felt about going on a vacation or going to New York City to see a play. Other feelings appear to be much too risky. What was I afraid of? Perhaps my parents would read the diary? I don’t remember worrying about that. Maybe I simply wanted to keep the history of my life simple and upbeat? What is so fascinating is I do remember intentionally leaving out anything risky at the emotional level. But what I can’t remember is why. Sometimes I think it was girlish wisdom and optimism combined. Could I have known at a deep unconscious level that staying happy means to a large extent not focusing on what is not right? When I decided to write The Truth Series for girls, tweens and teens, I had to make some other choices. Now I had to build into a young girl’s diary not only what happened to her, but also her feelings and insights. To not do so, would of course have made The Truth (I’m a girl, I’m smart and I know everything) and Secrets: You Tell Me Yours and I’ll Tell You Mine…maybe as dull as my paragraph above. Also the fictional diary would be without the fabric that is essential for the reader to process and benefit from. After all, it is the window the author provides into the feelings, thoughts, and happenings to the characters in a book, through which we can look at our own lives and how we are handling them. So I knew I had to take the concept of a diary but imbue it with feelings and words I never would have dared to write. I also knew I had to make my character much more universal that I ever was. 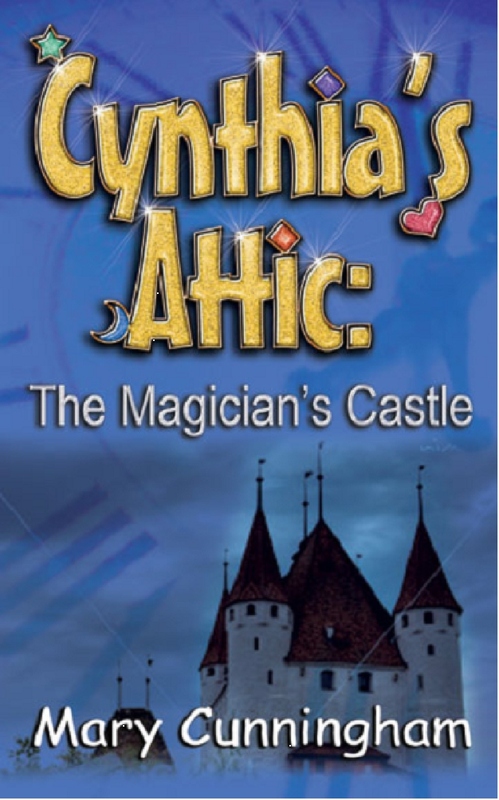 She has had happen to her so many universal themes: her parents do not get along; she has crushes; she has sibling issues; she has to deal with moving; a close relative dies; she has questions and no one to ask them to; she has jealousies; she discovers secrets in her family and the list goes on. Yet, she too, must remain basically upbeat and optimistic. That way she is a beacon of light and encouragement to other girls and also a role model for discussions with their moms, teachers, guidance counselors, etc. I know I have achieved this in The Truth Series. And yes, I have my three Girl Shout Diaries to thank for much of the success of these books. My Girl Shout Diaries reinforced the practice and diligence that is necessary to become a writer. They also left me fascinated with the diary concept and the intimacy it can achieve for both the writer and the reader. I am grateful I had the chance to write at such a young age. I am also grateful that no one checked my spelling! 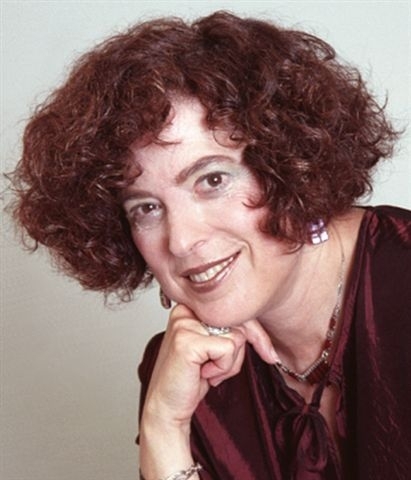 Dr. Barbara Becker Holstein, internationally known Positive Psychologist, is the creator of The Enchanted Self,(r) a systematic way of helping to bring more joy, meaning and purpose into our lives. Thanks to authors like her, more people have been studying the mind in psychology degree programs and great advances have been made in improving the human condition. Dr. Holstein has been a school psychologist for more than twenty five years. She has taught elementary school children and was an assistant professor of education at Boston University. She has been in private practice as a psychologist with her husband, Dr. Russell M. Holstein, in Long Branch, New Jersey, for over twenty five years. You are going to fall in love with Noonie Norton! Noonie’s Masterpiece tells the story of Noonie Norton, a ten-year-old aspiring artist who is stuck living with her Aunt Sylvia, Uncle Ralph, and annoying Cousin Junior. Her mother died when she was in kindergarten and Noonie’s father is an archeologist. Rather than take Noonie along on his many digs, the stability of a regular family life is what her father believes is best for Noonie. Problem is, Aunt Sylvia, Uncle Ralph, and that annoying cousin of hers can’t possibly understand Noonie’s genius. So Noonie wanders through different periods of her life trying to make it the best she can, sure that she’ll be discovered at any moment. When Noonie hears of her school’s art contest, she’s determined to win first place, even if Sue Ann Pringle wins everything. Maybe then, Noonie’s dad will come home pronto. Noonie’s Masterpiece is a brilliant story by Lisa Railsback. With Noonie Norton, Railsback has created a character that middle graders can’t help but sympathize with. Here’s Noonie, stuck with relatives while her father travels around the world with his job. She has a best friend, Reno, who is a bit of nerd. He’s a clumsy fellow, and he tries Noonie’s patience. Then, of course, there’s Sue Ann Pringle. That girl is perfect compared to Noonie and she wins all the school contests. To say that Noonie has a lot on her plate, is perhaps, the understatement of the day. This is just one of the many things that will allow readers to relate to Noonie. Since this story is told in a humorous way, even the tougher topics, like Noonie missing her mother, are easier for readers to deal with. 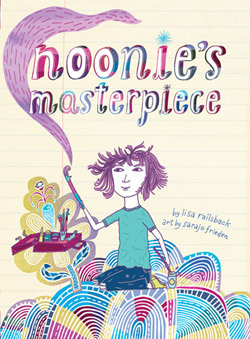 The artwork for Noonie’s Masterpiece was created by Sarajo Frieden. From depicting Noonie’s many wonderful creations, to the illustrations of Noonie, Ms. Lilly, the art teacher, Reno, Sue Ann, and more, Frieden did a superb job of bringing this story to life in a visual way. I choose Noonie’s Masterpiece while sitting around waiting for my laptop to reboot. The book I was reading was downstairs, so I picked up Noonie for a few seconds. I ended up reading all of Noonie’s story before continuing on with the other book. Railsback hooked me right away and I didn’t want to let go of Noonie until I was done with her. Let’s face it, if a character tells us that she’s a brilliant artist who hasn’t been discovered yet, and proceeds to tell you that she is going to explain her art while she’s alive because you never know if tomorrow she would be “trampled by a herd of kindergarteners” or “might choke to death on a rotten nut”, you want to pay attention to what she has to say. I immediately fell in love with Noonie, and you will too. It’s one of the best middle grade books I’ve read in while. Macy Carver is the new kid in town and she sure isn’t happy about it. With her father being transferred from Massachusetts to North Carolina, Macy left her best friend and all that she loved behind to start over in a new school where she is made fun of and bullied. But when a flash of light announces the appearance of her guardian angel, Jody, things start looking up for Macy, and with Jody’s encouragement, Macy finds a way to fit in and make some true friends. 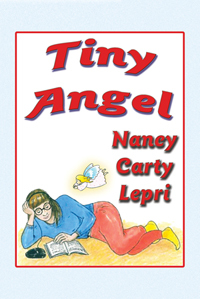 A fun and inspiring chapbook for tweens, Tiny Angel by Nancy Carty Lepri will quickly become your child’s favorite. In this engaging story, your tween will learn how to appreciate their talents, disarm bullies, and the importance of meaningful friendships. I love the unique aspect of Macy having a guardian angel who encourages and helps her along her journey through the challenging transition from the school and the best friend she lost to truly coming into her own at her new school and making new friends. And while Jody encouraged Macy, she also motivated her to think of others. I would have liked to learn a tiny bit more about Kenny the bully, just so we had an idea why he acted the way he did, but not having this knowledge didn’t take anything away from the story. As someone who was teased from the day she entered school until the day she left, I sympathized with Macy’s, and her friend Tomas’s, plight of always being picked on for one reason or another. While the messages in Tiny Angel are timeless, I also like how Lepri gave a contemporary feel to the story by having one of the characters being left alone at home each day after school while her divorced mother was off working. The insight into Susan’s character was something very special. 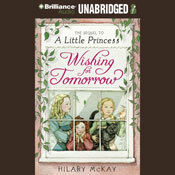 I would definitely recommend this book for your tween. Tiny Angel is an engaging and compelling story whose timeless messages will stay with your tween long after she’s read the last page.